Capt. John Smith leads a rag-tag band of English sailors & soldiers to the New World to plunder its riches for England (or, more precisely, for Governor Ratcliffe, who comes along for the ride). Meanwhile, in this "New World," Chief Powhatan has pledged his daughter, Pocahontas, to be married to the village's greatest warrior. Pocahontas, however, has other ideas. She has seen a vision of a spinning arrow, a vision she believes tells her change is coming. Her life does indeed change when the English ship lands near her village. 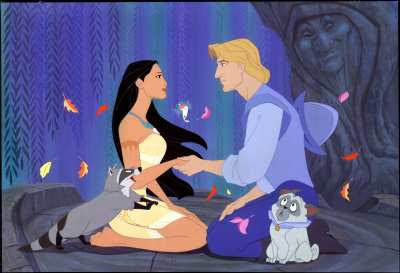 Between Ratcliffe, who believes the "savages" are hiding the gold he expected to be plentiful, and Powhatan, who believes these pale newcomers will destroy their land, Smith and Pocahontas have a difficult time preventing all-out war, and saving their love for each other.